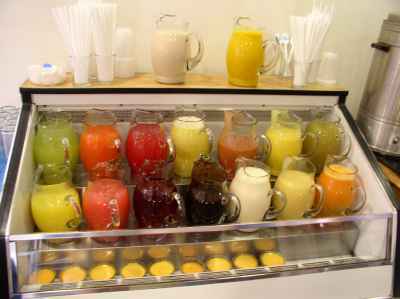 The airport cafe has an impressive selection of fresh fruit juices. 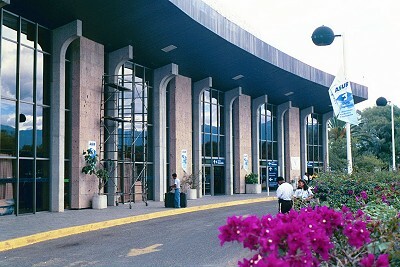 The Oaxaca airport has one terminal with 3 gates, A-1, A-2, and A-3. There is one waiting area for all flights. The engineer of this facility was apparently totally clueless when it comes to acoustics. The waiting area has large parallel building surfaces with zero absorptive material. The room acoustics in the waiting area is the worst I have every witnessed, rendering announcements totally unintelligible. You just have to laugh. When our flight was announced every single passenger remained in their seat. Not one person understood the announcement. You couldn't understand a single word or even determine what language was being spoken. The announcer stared at the microphone for a moment then walked over to the first row of seats and repeated the announcement without the PA. A couple of people on THAT row were able to understand what she said and got up and made their way to the door. Seeing this, the remainder of the passengers followed suit. Aside from the waiting area, the facility does indeed resemble an airport, with ticket counters, gift shops, ATM machine upstairs, bank with money exchange downstairs, a quite nice cafe (see photos), and bathrooms with those faucets that click on automatically when you stick your hands under them. It would have been nice if they had running water though. The Oaxaca airport is served by Mexicana Airlines from their Mexico City hub. Sometimes there are direct flights on Continental from Houston. There are also ticket counters for Azteca, Aeromexico, and Aviacsa. I highly recommend the Continental flight over Mexicana because it avoids the stop in Mexico City. Continental operates Embraer 145s. This is a small (about 50-seat) but fast jet. The seat bottoms are really hard but seating area is as roomy as the big planes and noise levels are low. But seriously think about taking a foam cushion. Regional flights are usually available to the coastal airports in Puerto Escondido and Huatulco via commuter or smaller aircraft. Aero Vega has had a flight from Oaxaca to Puerto Escondido. See a trip report. Aerotucan flies daily between Oaxaca-Huatulco and Oaxaca-Puerto Escondido. Departs Huatulco at 10:00 am. The return flight departs Oaxaca at 9:00 am. US$109 each way (2/10).